For today, I have a few decluttering tips, courtesy of Joshua Becker at Becoming Minimalist. The original post is here. I am going to be looking at each of these more closely in the coming weeks. But for now I will leave you with a tip of my own: when I am waiting for something – a load of laundry, pasta to cook, pizza to be delivered – I find myself with a small block of time. I could check Twitter, watch TV, or do something else mindless. OR in that time, I can tackle a small decluttering project. For example, we had pasta for dinner on Monday night. It takes about 10 minutes for the water to come to a boil and another 10 minutes to cook. That’s 20 minutes that I have to stay near the kitchen. 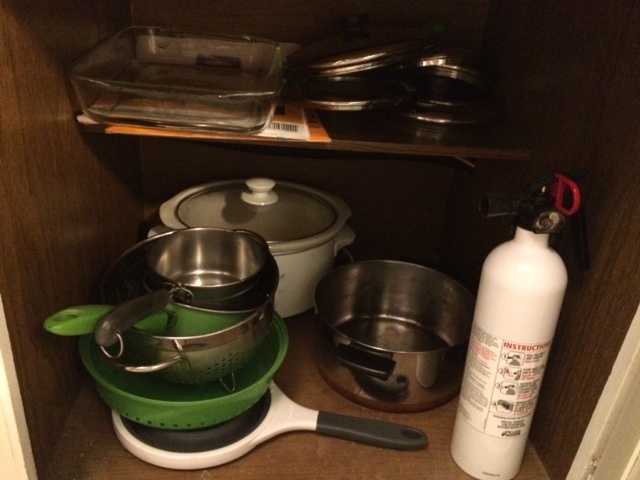 So I decided to use that time to move my soap making supplies into one of the lower cupboards (refer to the photo of my overflowing box of soap making supplies above). Here is the cabinet before making room for the soap-making supplies. 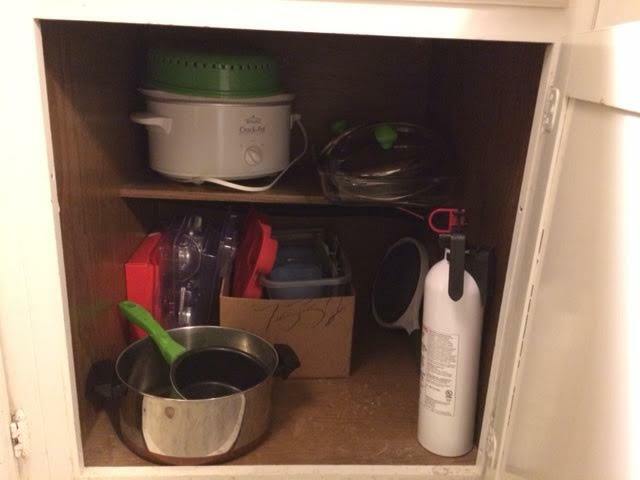 As you can see, there is lots of room, but the way the cabinet is set up, it hard to access it. You will notice that the colander and one pot are gone, as I pulled them out to make pasta. But there was plenty of room in the cabinet for them once they were washed up after dinner. Now, I am not suggesting that you cram decluttering tasks into every bit of down time that you have in your day! But look for little opportunities where you can tackle little tasks. This one only took 15 minutes, and now it’s done. Not every decluttering task has to be a huge production. Sometimes it’s as simple as just finding a home for something.